One of the original 13 colonies, Massachusetts is known as the landing place of the Mayflower and the birthplace of a revolution. The state’s capital, Boston, served as the backdrop for historical events including the Boston Massacre and the Boston Tea Party. Today, Massachusetts is a destination not for those who want to revolt, but for those who want to retreat. Known for its picturesque coastline and countryside, Massachusetts entices visitors with its sandy shores and fall foliage, in addition to its history. Find out more about Massachusetts at DiscoverAmerica.com. Population: More than 6,585,000 people live in Massachusetts. Geography: This New England state stretches 295 kilometers wide and 182 kilometers long, and shares a border with New Hampshire, Vermont, New York, Connecticut and Rhode Island. Higher Education: With its Massachusetts School Laws, the Bay State laid the foundation for mandatory public education in the United States. Boasting more than 120 institutions of higher learning, Massachusetts continues to lead on education with two of the world’s most widely recognized schools, Harvard University and the Massachusetts Institute of Technology. Massachusetts is also home to Amherst College, a top-ranked liberal arts school, and the University of Massachusetts, the state’s public institution. 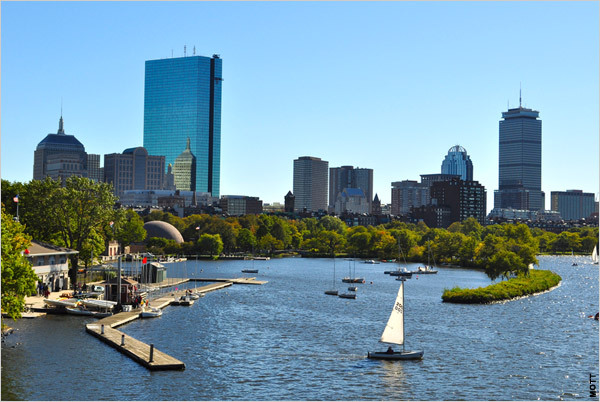 Major Industries in Massachusetts include finance, technology, medicine and education. The state produces the United States’ second-largest cranberry crop after Wisconsin. Dairy and poultry products, nursery and greenhouse produce, vegetables and fruit are also important to Massachusetts’ agriculture industry. Famous Bay Staters include four U.S. presidents, John Adams, John Quincy Adams, John F. Kennedy, George H.W. Bush; talk-show hosts Conan O’Brien and Jay Leno; actor Steve Carrell; authors Louisa May Alcott, Nathaniel Hawthorne and Edgar Allan Poe and poet E.E. Cummings. International Connection: Boston is a sister city to the Taipei Municipality. • Massachusetts is not officially a state; it is a commonwealth. • The first basketball game was played in Springfield, Massachusetts, in 1891. Today, it is the home of the Naismith Memorial Basketball Hall of Fame. • The first Thanksgiving Day was celebrated in Plymouth in 1621.